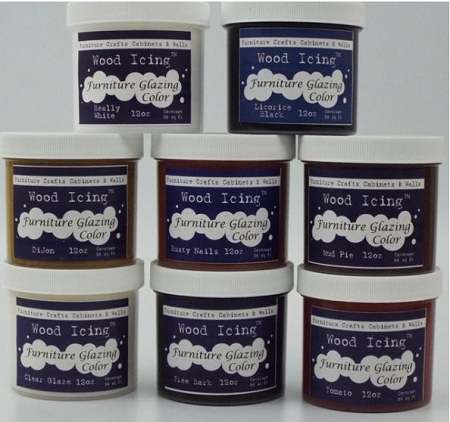 Home > Wood Icing® > Wood Icing® Furniture Glaze - Indigo Blue 12 oz. Water based colors used to create a wood tone color. This is an Indigo Blue coloring product that can also be used as stain for unfinished wood or may be used for a glazed effect over painted surfaces. The example of the cabinet shown was created using Textura Wood Icing, which is sold here. We used a piece of lace..... pressing the fabric with an embroidered lace pattern into the Textura Paste. Remove lace immediately and allow that layer of Textura to dry. Stain the Textura with Indigo Blue. Let that dry and apply a barrier coat of our Poly-Acrylic Top coat - sold here on our shopping cart. Then go over the top of that with Black Licorice Glaze. Next, lay a stencil down and apply the Textura Paste to create a raised effect. Wait for it to completely dry! 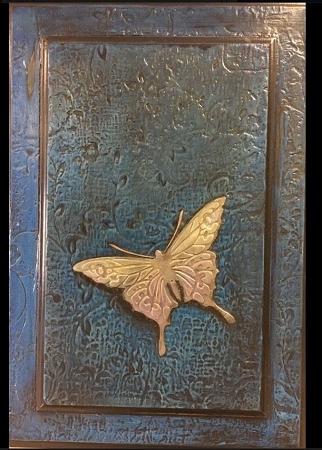 Use our Modern Masters Gold paint to create brush over the butterfly only. Let dry.